1. Cook the rice in boiling water for 10-12 minutes, then drain. Soft boil the eggs for 4 minutes, leave to cool then peel. 2. Meanwhile, heat the oil in a large frying pan and fry the onion, courgette and pepper for 4-5 minutes. Add the tikka paste and peas and cook for 1 minute. 3. Stir in the rice and crème fraîche and heat through. 4. 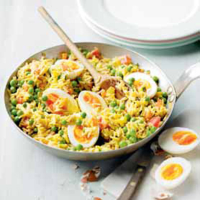 Cut the eggs into quarters and place on top of the kedgeree and serve.